Photograph collection of webmaster 7510 at Springs Branch, date unknown. 7510/25160 was one of a few Class 25s never to be allocated to North West depots. 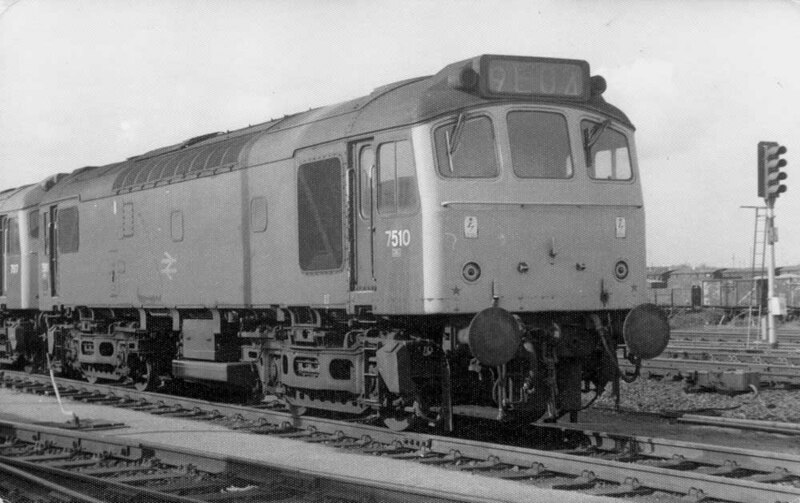 The eighteen year career of D7510/25160 included four years allocated to Western Region depots in the mid 1970's, the remainder was spent allocated to London Midland depots. Time between withdrawal & scrapping: 58 months. April 1968 to the London Midland (Midland) Lines (LMML). June 1968 to the Nottingham Division (D16). 25160 was the 139th Class 25 to be withdrawn, one of four retired during October 1982. 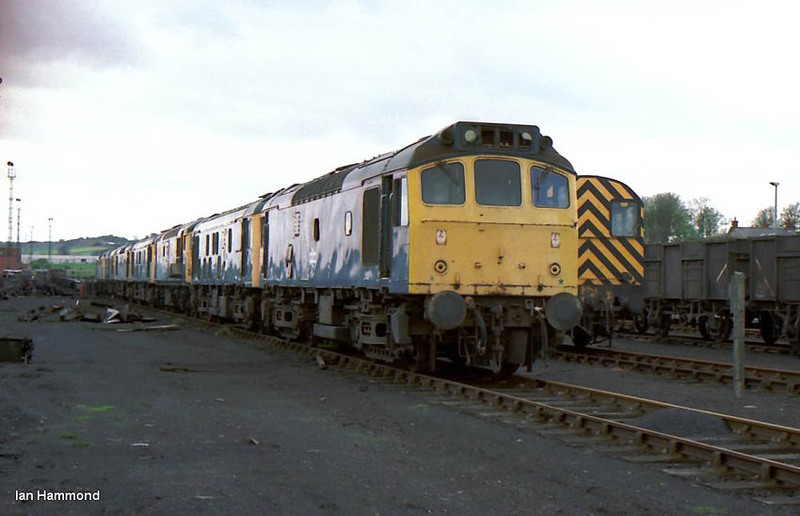 After its withdrawal 25160 was stored at Polmadie from October 1982 until November 1983 at which point it was moved across the mainline to Shawfields Sidings. Whilst dumped at Shawfield it made the inevitable trip beyond the buffer stops, joining a small but elite band of locomotive to be so dealt with by the locals. It moved to Thornton Junction with 25046 on April 29th 1987 for cutting, which ceased before the cutters got to 25160. 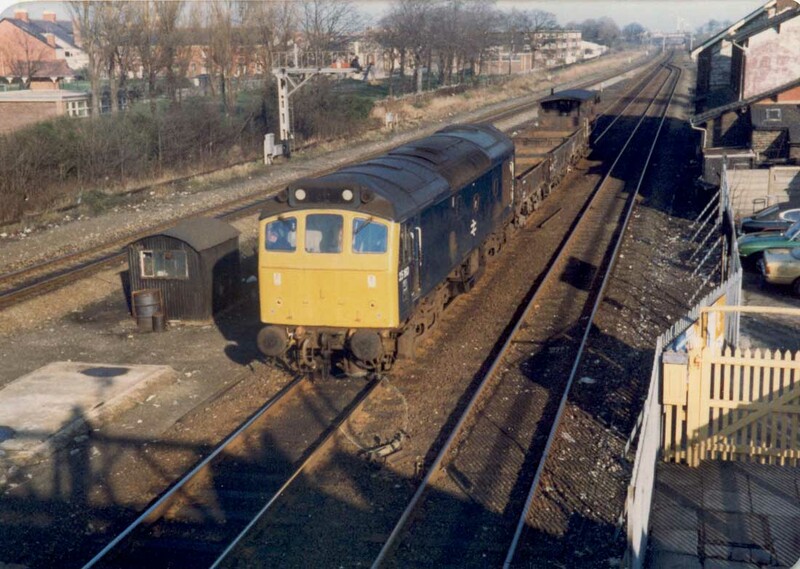 It then moved with 25046 to Vic Berry's, Leicester via Mossend (June 10th 1987), Carlisle (June 11th 1987), Basford Hall (June 22nd 1987), Leicester Humberstone Road (hauled by 31168) and into Vic Berry's, Leicester (June 23rd 1987). By the end of July 1987 the locomotive had been scrapped though the cabs lingered until November 1987. Noted Derby Works June 1977. On June 24th the summer dated round trip Nottingham - Llandudno Town was worked by 7510 & 7540. On June 3rd a Melton Mowbray - Slough special was worked out & back (?) by 7510 & 5234. Condition February: two-tone green livery with full yellow ends, straight sided sandboxes, three-rung bogie mounted footsteps, engine exhaust in original location, 'D' prefix still carried. With March drivers trained on Class 25s they occasionally handled odd workings - on December 4th 7510 dragged Class 47 No.1502 from March to Stratford. 25160 was noted at Tyne Yard on August 12th. 25160 was noted on a Tyne Yard permanent way duty on February 2nd. 25160 was noted at Frodingham on April 21st. On June 15th 25160 worked the 20.30 Crewe - Bangor and the 22.45 Bangor - Llandudno Junction. On July 2nd a Weston-super-Mare - Aberystwyth day excursion was worked from/to Wolverhampton - Aberystwyth by 25160 & 25153. On September 13th 25160 worked the 11.30 Bangor - Manchester Victoria, the 15.32 Manchester Victoria - Bangor and the 19.30 Bangor - Manchester Victoria. A Spalding - Aberystwyth day excursion on October 13th was worked from/to Walsall - Aberystwyth by 25160 & 25216. 25160 was noted at Cockshute on April 15th. 25160 was noted on an up freight service passing Conwy on the April 21st. On July 10th 25160 was noted shunting wagons at Abergavenny, believed to be the 7C05 TThFO 11.50 Moreton-on-Lugg to Severn Tunnel Junction Undy Yard local freight. On August 30th 25160 worked the 09.42 Llandudno Town - Manchester Victoria. Photograph courtesy John Powell 25160 at Prestatyn with a short permanent way train, date unknown. A short trip freight was noted passing Horbury Junction for Healey Mills yard on March 27th. 25160 was stabled at Cockshute on April 11th. On August 2nd 40130 failed at Mostyn Dock working a Holyhead - Bournemouth day excursion, 25160 dragged everything to Chester where 40135 took over. On August 14th saw 25160 work the 17.42 Manchester Victoria - Llandudno Junction. A month later on September 12th the 10.10 Euston - Aberystwyth from Birmingham New Street and the 18.00 Aberystwyth - Wolverhampton were worked by 25160 & 25154. On May 5th 25160 worked the 09.20 Lancaster - Barrow. The next day, a very wet May 6th, 25160 was noted at Blackpool North with a single parcels coach. On May 7th 25160 worked the Edge Hill - Red Bank vans, comprised of about thirteen vehicles. 25160 was stabled at Bristol Bath Road depot on May 17th, later that day it would work the 3S15 Glasgow vans. The last recorded passenger working for 25160 took place on June 26th when 25160 worked the 09.45 Manchester Victoria - Bangor and the 13.58 Bangor - Manchester Victoria, the remainder of the diagram was worked by 47555. 25160 was the Manchester Victoria pilot on July 24th. Two days later (26th) 25160 was noted passing through Manchester Victoria with vans for Red Bank. 25160 was withdrawn on October 10th 1982. The only 25s now remaining in Scotland were 25028/46 and recently arrived 25160, all withdrawn at Polmadie. Whilst dumped at Shawfield Sidings, Polmadie, 25160 ran off the end of the siding, derailing the No.1 end bogie. This was one of several locomotives to be derailed here in this manner. Photograph collection Ian Hammond 25160, 25046, 26013, 25028, 25318 & 27016 at Thornton Junction on May 3rd 1987. All these locomotives would eventually be dragged down to Vic Berry, Leicester for scrapping. Page added December 1st 2012.